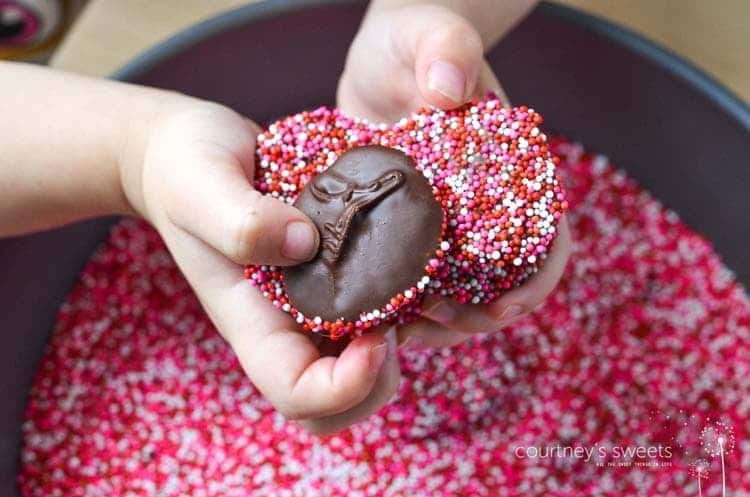 If you forgot to make your Valentine’s reservations, Here are 16 Last Minute Valentine’s Recipes all ready in under an hour. From Valentine’s Cocktails, Valentine’s Appetizers, special dinners for Valentine’s and Valentine’s Chocolate Desserts, pick one or two and feel the love. Circle of trust here: I have nothing planned for Valentine’s Day with my husband. NOTHING. 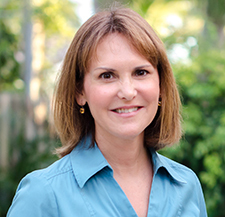 I’ve been working very hard on things RELATED to my blog — but not actually cooking fun recipes to share with you. #loser. 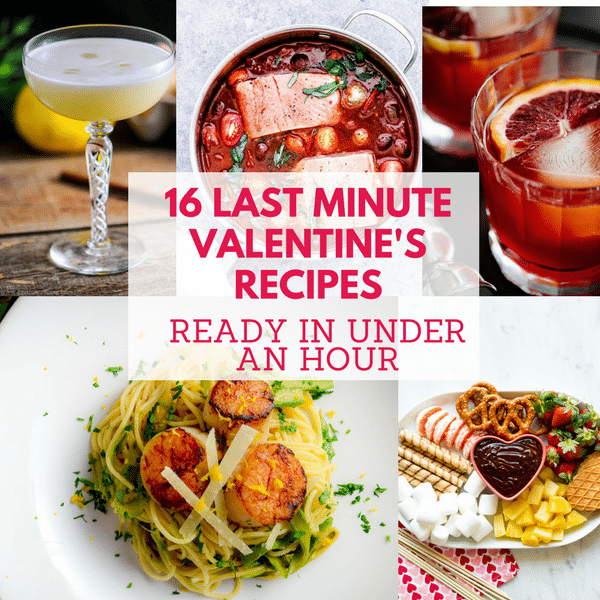 But I figure, I can’t be the only one without a Valentine’s plan… and so, I thought I’d put together a roundup of recipes from my archives as well as a mouthwatering collection from my best blogging buddies. These sips, bites and sweets are suitable for Valentines-ing but don’t require advance planning and time. These 16 Last Minute Valentine’s Recipes require less than an hour from start to finish — most will take less. Happy Valentine’s Day! 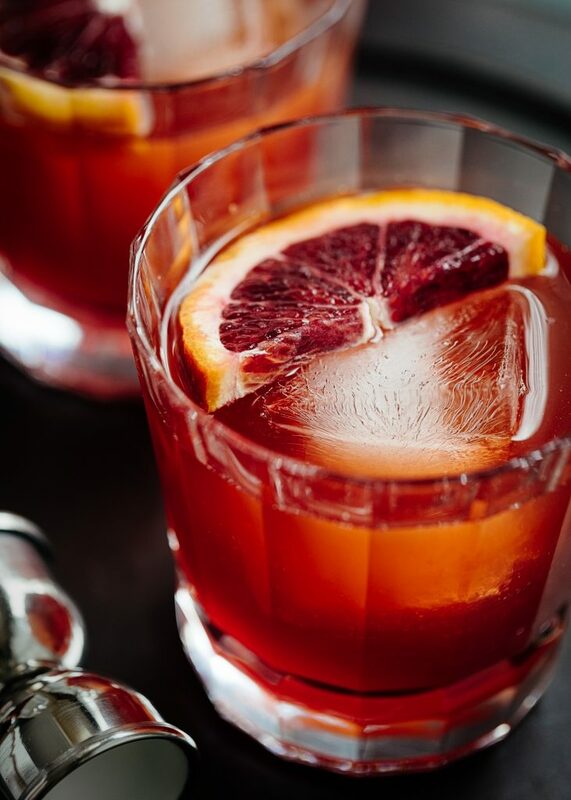 The Crimson Kiss – It may look like Kool-Aid, but it’s got a kick. Sure to grease the wheels for the evening ahead. 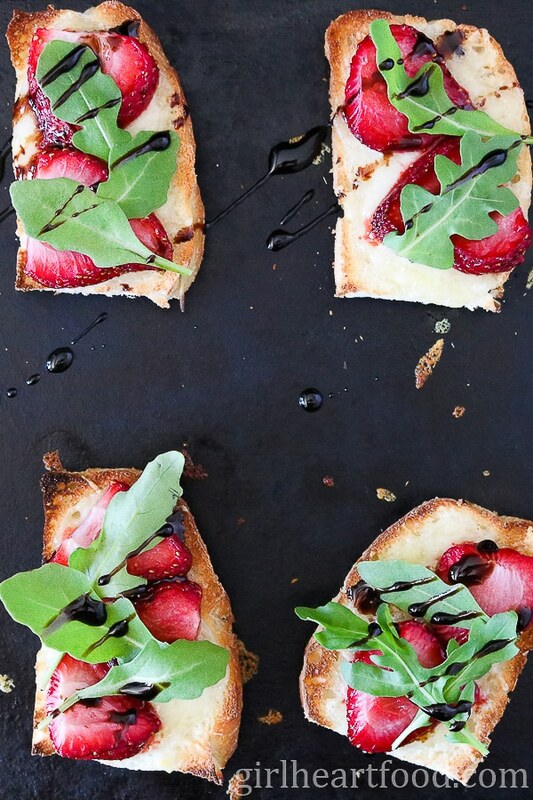 Roasted Strawberry and Tipsy Cheese Crostini – By Girl Heart Food! If this doesn’t tug your heartstrings, you might be missing that organ. 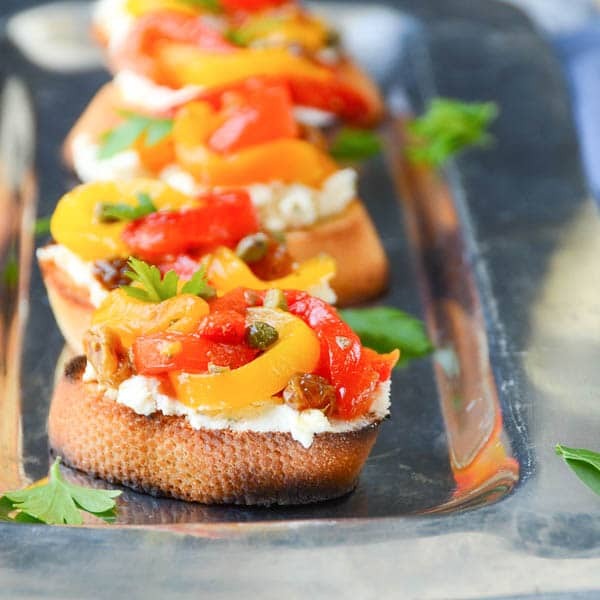 PEPPERONATA BRUSCHETTA – toast the bread in the oven if it’s too cold for the grill, a smear of peppered goat cheese and some quick marinated bell peppers make this app great with a glass of bubbly. CLASSIC OYSTER STEW – no shucking oysters here! Grab a fresh pint from your market and this sultry, rich soup will be on your table in about 20 minutes. 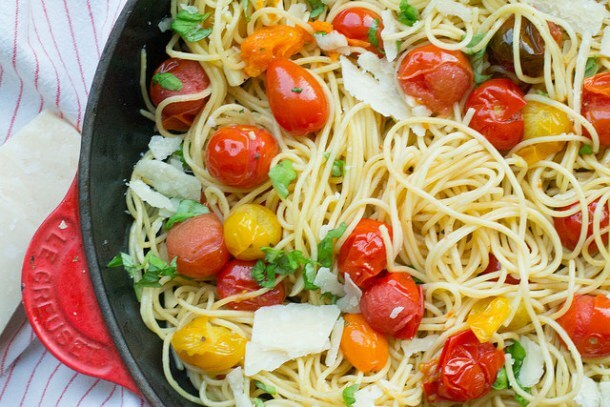 ROASTED TOMATO AND GARLIC SPAGHETTI – By Nourish and Fete – * Sigh* I mean, it’s pasta, you can’t EVER go wrong with pasta! PORK TENDERLOIN WITH PORT & DRIED PLUMS – You’ll like this one because it’s a complete meal in under an hour — and half of that time is roasting… so you can, you know, sip some wine and make kissy-face. RACK OF LAMB WITH HERB CRUST – Sounds fancy, right? Ridiculously easy! Costco sells these racks for about $12-14 and they will easily feed 2-3 people. And what’s more carnal than gnawing the meat off a bone? 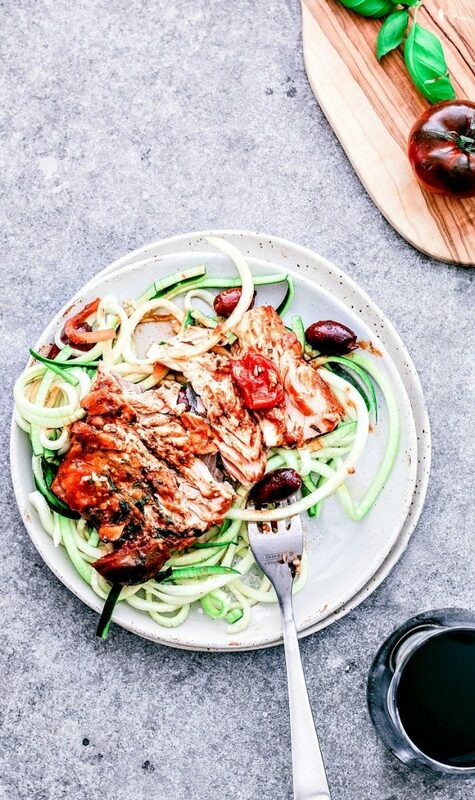 POACHED SALMON FILETS IN TOMATO WINE SAUCE – By Killing Thyme Here’s a delicious quick low-carb alternative — so you won’t get weighed down before other activities can ensue. 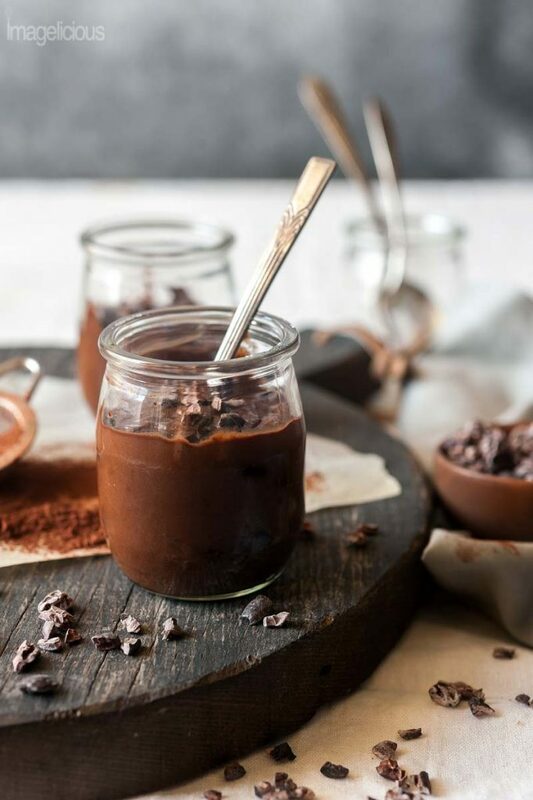 Avocado Banana Chocolate Pudding – By Imagelicious – Healthy and super fast to make, you can eat this and skip the gym to sleep in the next day! BONUS! 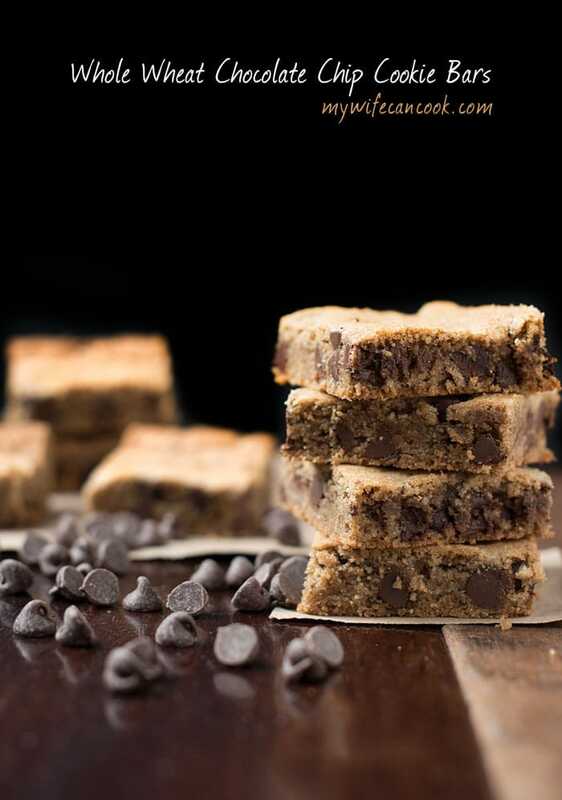 Whole Wheat Chocolate Chip Cookie Bars – By My Wife Can Cook! I’d say SHE CAN! 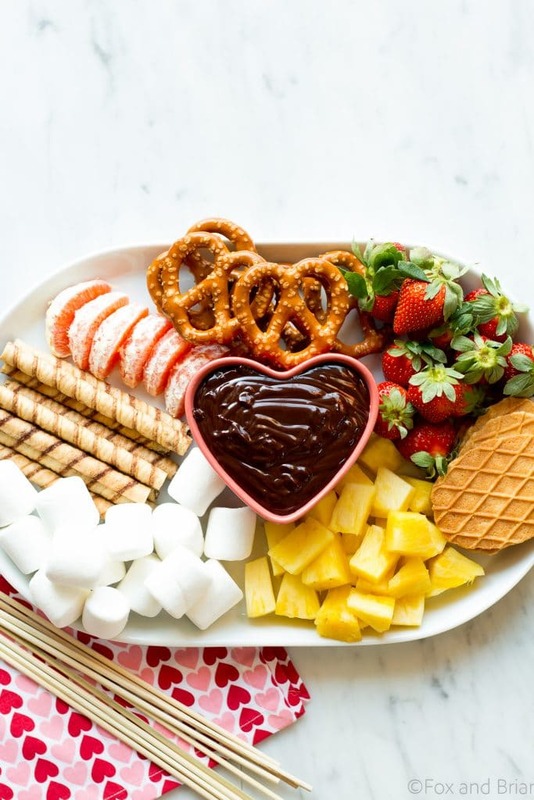 Chocolate Fondue by Fox and Briar is made for Valentine’s Day. Why do you think “The Melting Pot” is so popular? 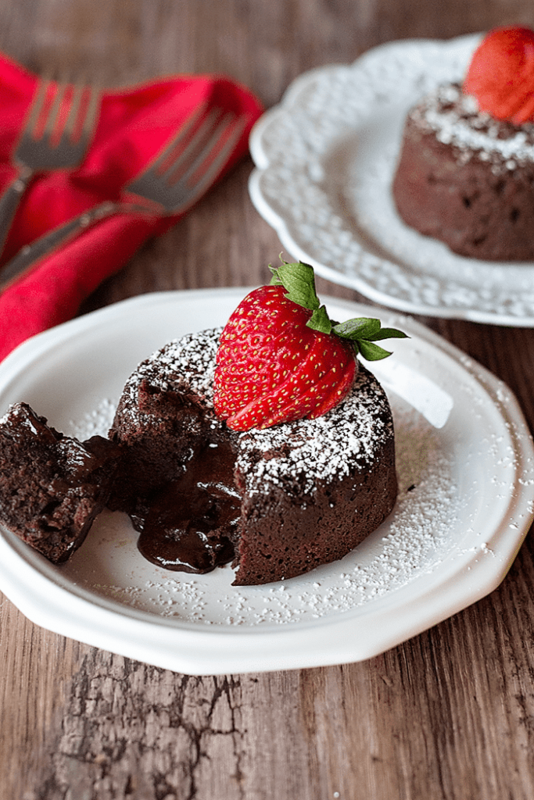 MOLTEN CHOCOLATE LAVA CAKE – By Unicorns In The Kitchen – I’m having a visceral Pavlovian-type reaction to this. Are you? Lots of tasty dishes here to celebrate the day. We always cook at home (except for this year)….we find it fun and romantic. So many great ideas here! Thanks for including my scallop recipe. 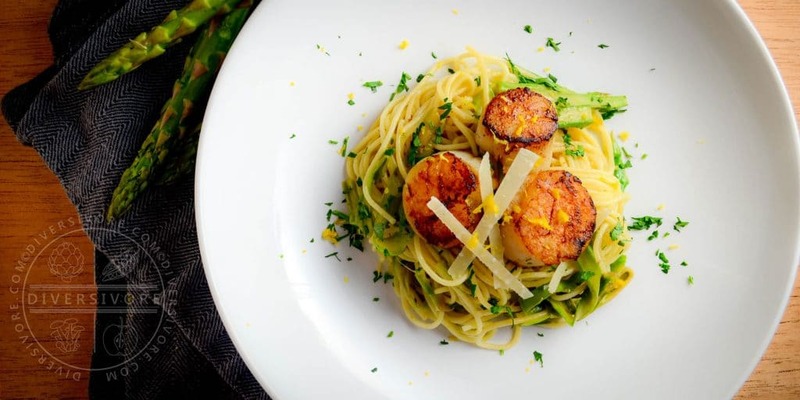 It’s definitely one of my favourites, and scallops in general are a go-to for a fancy-but-easy romantic meal! Cheers. I completely agree — thanks for working with me on this last night, Sean! Such a fantastic collection of recipes. Pinned! Beautiful collection. That banana chocolate pudding is killer. Having a romantic night out is wonderful for Valentines, but not always possible, especially midweek. These are some lovely ideas for dining at home, and still having a treat. 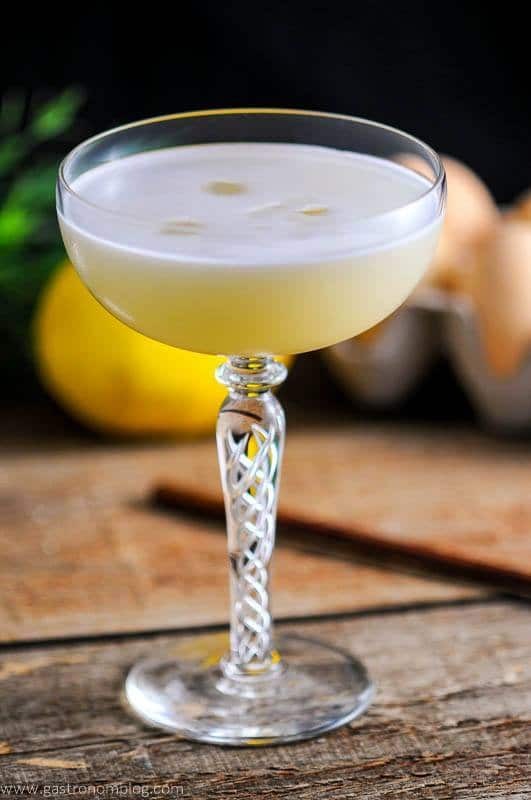 The cocktails look wonderful, and I am intrigued as to the story about your Grandmother. I can’t put that out in public — sent you a message. Such a delicious round up! Thanks so much for including my roasted strawberry crostini! Will be sharing 🙂 Our fur baby’s birthday is today so we will be celebrating that and making a special meal this weekend to celebrate Valentine’s Day. Enjoy your day!